Thanks to Pax and Fabio ! - Hey, And the story with Leonardo DiCaprio? - It is as follows: he is my friend, is charming, is nice, is a super fine person, is very intelligent. We are going out. We are getting to know each other. We cannot say yet that it is a courtship. I don´t know what People (magazine?) said. - They said nothing. They had photographs of the two of you together in California, in the United States. - Didn´t he hit on you? - You are trying... (Smiles) I am saying nothing more on that. - They say he likes you very much, but you just want to be friends, is that right? - I don´t know. I never heard that. - I only ask you to give you the opportunity to clarify. - I don´t know. (Big naughty smile) For the time being, I am happy this way. - He has a potbelly, no? - He has to gain 25 kilos (approx. 50+ pounds) for this new film (Gangs of New York). He is going to play the role of a tough gangster. This is something an actor does. You remember Robert De Niro, who gained 30 and a few kilos to make Raging Bull? 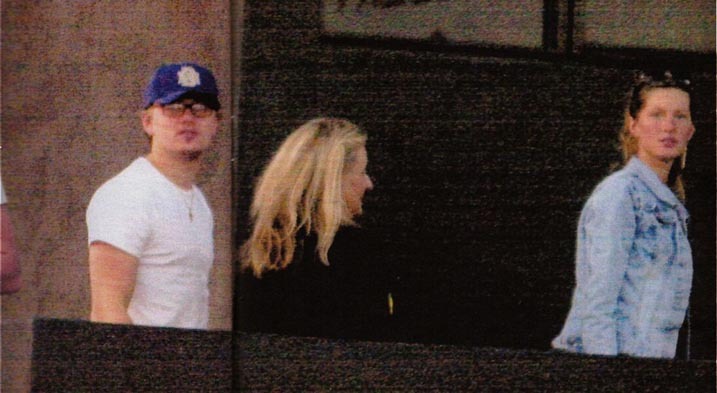 - What is the nicest thing about Leonardo DiCaprio? - He understands what I go through (with the frenzy) because he goes through the same things, people speaking badly of him, wanting to knock him down, out of envy. People say lies that hurt sometimes. We talk a lot and he makes me feel better.